CEDAR CITY — Republican Mitt Romney and Democrat Jenny Wilson, the two major candidates vying for the retiring Sen. Orrin Hatch’s seat in the U.S. Senate, squared off in a one-hour debate on the Southern Utah University campus Tuesday night. Romney, the former Massachusetts governor and U.S. presidential candidate, and Wilson, who is currently serving her second term on the Salt Lake County Council, answered a variety of questions during the debate, which was produced and sponsored by the Utah Debate Commission and hosted by SUU’s Michael O. Leavitt Center for Politics and Public Service. 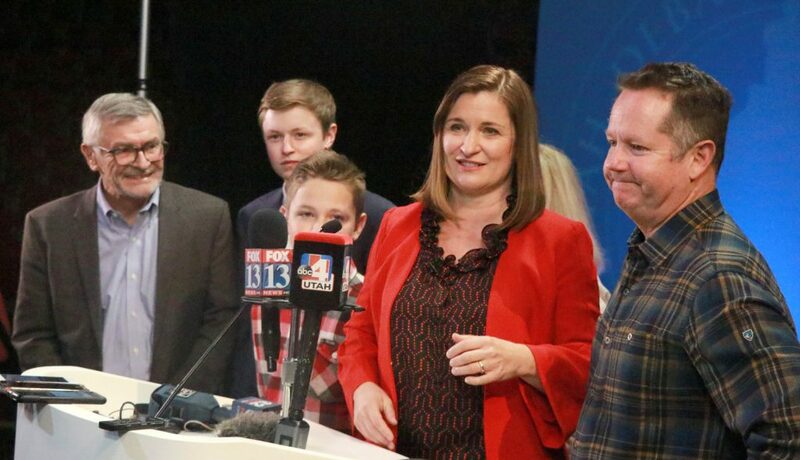 The event was broadcast live on television and radio stations throughout Utah and was carried nationally on Fox and C-SPAN. The debate was moderated by Bruce Lindsay, with additional questions coming from panelists Max Roth of Fox 13 News and SUU political science student Cami Mathews, in addition to a handful of questions submitted by the general public via social media. Candidates took turns answering each question in a minute or so, after which they were allowed time for a brief rebuttal, if desired. 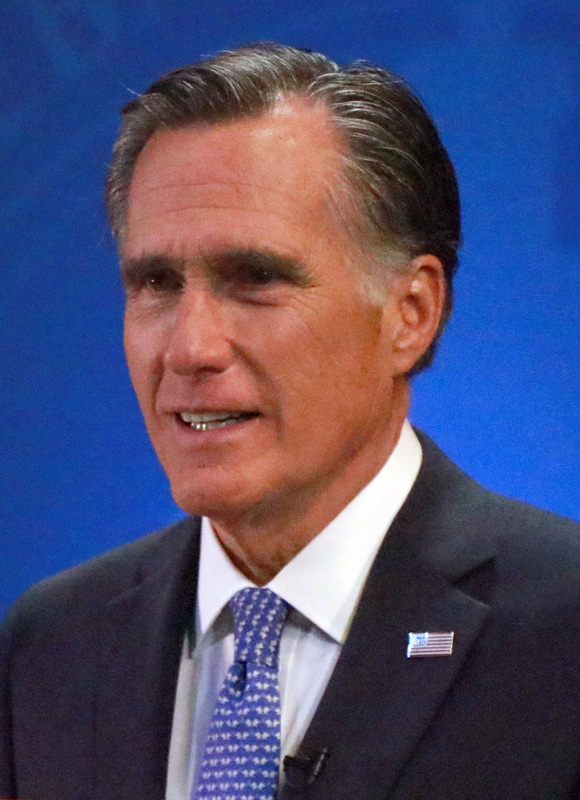 During the debate, Romney emphasized that many issues, ranging from gun laws to health care, are better handled at the state level rather than by the federal government. “Utah knows better how to run Utah than Washington does,” he said. Wilson said she shares a “deep frustration” with many voters regarding the current state of national politics. The candidates weighed in on a wide range of topics, from tariffs to tax cuts, immigration to Medicare and gun control to national security. Both agreed that many issues require bipartisan cooperation to solve. “We can work to find solutions across party lines,” Wilson said as she addressed the issue of the future of Social Security and Medicare. 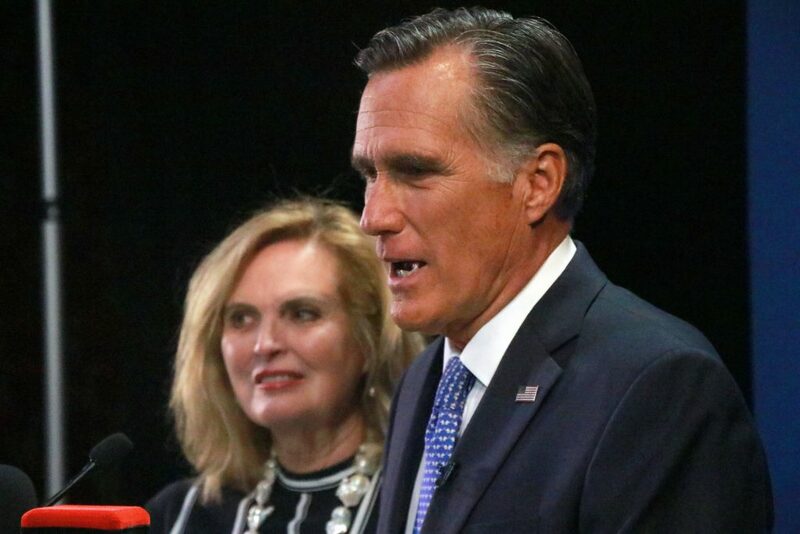 “There’s got to be an effort to reach across the aisle,” Romney agreed. When asked about President Donald Trump, Romney acknowledged that while he and Trump have had their differences in the past, he prefers to look to the future. “He’s doing a lot of things I agree with,” Romney said. In a short press conference that followed the debate, Romney reiterated his support of Trump but said he wouldn’t hesitate to speak out against the president if the situation called for it. “I’ll be with the president when I think he’s right for the country and for the state, and when he ever says or does something I think is divisive or misogynistic or anti-immigrant or racist, I’ll call him out on that,” Romney told reporters. During the debate, Wilson voiced her disapproval of Trump and said she hopes his presidency will not extend to a second term. “I’m frustrated that this Republican Congress hasn’t held the president accountable,” she added. The candidates were also asked about Question 1 on the Utah’s general election ballot, a nonbinding question that asks if the state Legislature should raise the tax on gasoline sales by an additional 10 cents per gallon. Romney said he’s watching the issue with interest but said he prefers to leave it up to the voters. “I haven’t weighed in because I want people to make their decision without a sense of where I’m going to go,” he said. Romney noted that the gas tax increase is likely to disproportionately affect people in rural areas because they tend to drive longer distances, a point that Wilson also agreed with. Wilson also indicated she’s not convinced about the plan. Both candidates also talked about the importance of water conservation and both said they’d continue to fight for better health care coverage, even for pre-existing medical conditions. Both candidates also said they’d look for ways to improve the process for confirming judicial nominees, in the wake of the recent and highly contentious appointment of Brett Kavanaugh to the Supreme Court. During his closing remarks, Romney cited the six-year term length for U.S. Senators. 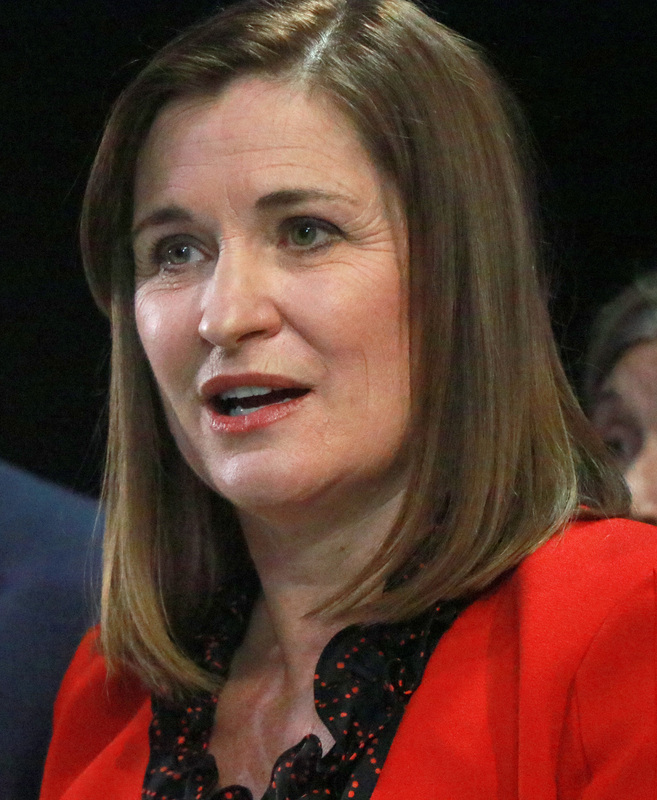 Wilson concluded with a plea to all Utahns. To view the broadcast in its entirety, click here. General election day is Nov. 6, but many Utahns will start seeing their mail-in ballots arrive in the mail within the next week or so. In addition to Romney and Wilson, three other third-party candidates also appear on the ballot for the U.S. Senate race: Constitution Party candidate Tim Aalders, Libertarian candidate Craig Bowden and Independent American Party candidate Reed McCandless. Mitt Romney. 🤔 The best way to describe him is that pair of pants that you first loved when u put the jeans on in the dressing room. But when you get home, and after a wash or two, the pants have changed. They’re just not all you hoped they would become. They used to fit flawlessly around the waist, but now they’ve decided to slide down your crack uncomfortably. Suddenly it’s a little tight on the thighs as well. You could have sworn that at first they were not that way. In the end, you learn those pants have changed based on external influences, susceptible to coercive forces, like a flock of sheep, or a chameleon in distress. 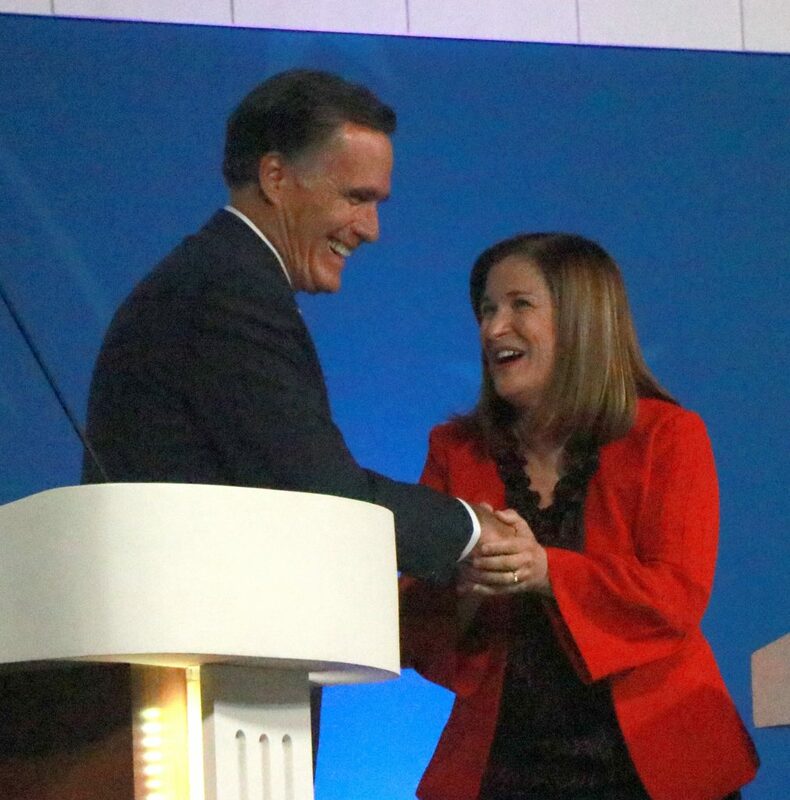 Mitt Romney in Utah will gladly follow the orders of the Mormon church. In Utah, he will adjust former stances and opinions, just as he’s always done. He used to be a harsh critic of Trump, but now he says he agrees with most of what Trump is doing. I believe he is sincere, at least, in disagreeing with Trump’s divisive, racial, and hurtful policies. I think the one thing that is consistent with Romney is he can work across party lines and engage in the process with more decorum and respect than the other buffoons at the capitol. This seems to be the only conviction he knows his mind on. The rest of his stances appear to be fueled by what he feels will benefit him in his current circumstances. Can you please site one of Trump’s “divisive, racial, and hurtful” policies? I think it will be a long wait! I’m not the one spouting fake accusation. You are my friend.. site one please! Chris, Who appointed you the spelling nazi? You are obviously just another confused liberal. Keep watching all that fake news…It will do that to you! Tired of losing yet? Here’s one: Trump’s US travel ban. Specifically Iran, Libya, Syria, Sudan, Yemen, Somalia, No Korea, Venezuela, and Chad. How’s that long wait going for ya? Because I just dumped the facts in your lap. And that’s just ONE example. Want another? Nothing racist or divisive there.. try again peaplant! Nothing racist or divisive, TO YOU. I asked you a specific question. Would you like another example? Please point out the specific question you imagined asking. You didn’t ask a relevant question! Keep trying though. I know it’s hard for you. You did precisely what I thought you’d do. Diversionary tactics. Read for comprehension, John. I asked you a specific question. If you can’t answer it, don’t bother responding. Really, look..there is no question.. it’s not there..
ice, you have to try harder. All of those nations you listed have one thing in common: they are either failed states(like Somalia), thus a breeding ground for non-state terrorist organizations, or are state sponsors of terrorism(like Iran, the largest state sponsor of terrorism worldwide). None of those nations you listed are even the same ethically. Iran has Persians and Iranian-Arabs. And are people from North Korea the same ethnicity and religion as those from Libya or Chad? No. You just demonstrated in your list why those nations Trump listed was NOT a racial or religious ban. You clearly miss the point here. Why was there no ban in place BEFORE Trump took office? I can answer that for you… because it wasn’t necessary. But I”m sure you’ll blame Obama for that, right? After all, you people on the right blame him for everything else. Now, all of a sudden that Dotard J Drumpf is president, these nations are somehow off-limits and ban worthy. Are you kidding me? Can you not see how this is playing out? Pay attention. Do you have any clue how many people come from these countries who AREN’T terrorists? Do you care that people in these countries already live in America and have family who they’re desperately trying to bring to this country for a better life? Do things like that even matter to you? Or are you just another one of those people who dismiss these folks as “state-sponsored terrorists” and hope they stay in their countries because Trump told you they should? Because they’re, “bringing in drugs, they’re rapists.” Yeah, I’m not buying it. Get your head on straight. My my… the hypocrisy here is staggering. Makes me thankful that iceplant is not in charge of our national security. He would just let anyone in the country, and welcome all the illegals with open arms. Maybe he should start welcoming them into his own home. Glossing over my comments and making gross generalizations. You’re approaching predictable. Stay classy. Frozen veggie is one to speak about hypocrisy..hahahaha! You didn’t ask a question.. are you hallucinating again? You didn’t provide any relevant facts or accusations to make your point! Keep going though, the laughs you provide are pretty good. No, I did ask a question. Look for the question mark, Cleetus. Expanding a historically rarely used zero-tolerance policy to include families that are seeking asylum; separating those families into what can best be called internment camps; forcing young kids to represent themselves in immigration court. I would say that clearly qualifies as “Trump’s divisive, racial, and hurtful” policy. If you say so! So in your world enforcing the law is divisive, racial, and hurtful? Liberals, gotta laugh at them. Zero-tolerance policy enforcement against asylum seekers isn’t necessary or consistent with spirit of the law, national needs, or international agreements. Its a radical interpretation of law that has been a stain on our country. Obama was also enforcing the law and curtailing illegal immigration (more deportations than any other president) but didn’t find a need ir benefit to separating asylum seeking families. When you get past simplistic partisan rhetoric you can see how inhumane Trump’s policy has been. Even Republicans have admitted the error of the policy. And who do you think is paying for their $700/night/per person stay at Trump’s cronyism facilities? And if you can’t see how Trump’s immigration policy has been inherently racial than you are ignoring the facts. He doesn’t even try to hide it; he relishes in it openly. Plus, I have satisfied your demand. Interesting as you yourself never contribute anything of content. Just partisan insults that are old and tired. I’ll also give you a hint. I’m not a liberal or even a democrat. Read back and see how often I critique Ed here. Critiquing Trump’s policy doesn’t make one a liberal. Its just a lazy assumption on your part. Oh, here we go with the “enforcing the law” defense. That’s one weak argument. The only ones laughing are those who can see through your facade. Like me. Still waiting for you to answer how in your world enforcing the law is divisive, racial, and hurtful? You said it, I didn’t. And no, you have not provided an actual answer to your fake accusations! And I’m not going to answer your ridiculous question because the answer is obvious to anyone with a brain. Or a heart. Do I have to spell the words out for you? Grab a dictionary and look up the word bigot. You can START there. what are you, a vegetable or something? Still waiting for you to answer how in your world enforcing the law is divisive, racial, and hurtful? You said it, I didn’t. And no, you have not provided an actual answer to your fake accusations! Its funny to me how centrist Romney is now in American politics given how far major candidates from each party have leaned farther to the limits of their parties. On the left you have more and more candidates pushing democratic socialism. On the right you have Trump and his alt-right base who have no loyalty at all to conservative principles of civil liberty and old American values. Its even funnier when you realize how centrist Jenny Wilson is as well. Classic democrats and Republicans are nkw just disparaged as DINOs and RINOs because they recognize we are stuck working together to keep the federal government running. To be right on any issue just do the opposite of B&F.. No one is wrong more often, except maybe eddy! Drongos have ears that are very close together..hahahahahaha! Look it up, drongos! We have Redbud devolving into black and white claims that if you don’t support Trump’s extreme zero-tolerance policy than you must support all illegal immigration and Happycommenter constantly moving the goalpost (no answer will ever be good enough for him as he’s a troll). Doesn’t leave any room for immigration reform that doesn’t inhumanely target people of color seeking asylum. There were always hard-right ethno-nationalist throughout American history but rarely did they get support from the POTUS and Congress in such broad ways. But as we should know by now, an over-powered POTUS not checked by Congress can get away with alot, we’ve seen it with just about every president in my lifetime. Its just getting worse and more extreme each presidency. What Redbud and HappyJohn are doing is just the hard-right version of Obama sychophants did for 8 years. It just happens to expose how empty the “compassionate conservativism” platform is when it gets its own unilateral power. We’ll see if middle America (people $60k and under who largely voted Hillary) and Independents care enough to turn Congress enough to require bipartisan legislation again. Normally happens during midterms but hard to predict in this new atmosphere. But its hard to not see it happening during the next general election when the limited short-term tax cuts expire for the middle class and our bills rise to the highest level in decades. And when real conservatives come out of the framework and expose how much Trump has expanded our deficit in so little time. These two alone give me real pause about the future of our nation. Knowing that there are millions out there just like them. When this is all said and done, we’ll be lucky if we have anything resembling a “United” States of America. And we’ll certainly know who the real enemies are. They’ll walk amongst us. This is what Trump wants. It’s what they want too. For those who don’t agree with them to live in fear. About as un-American as you can get. I can’t wait to vote. Jim Crow was the law of the land. It was unjust and in direct conflict with civil liberties. Slavery was the law of the land. It was unjust and in direct conflict with civil liberties. Internment of Japanese citizens was the law of the land. It was unjust and in direct conflict with civil liberties. Stop and frisk was the law of the land (in NY). It was unjust and in direct conflict with civil liberties. Do you want more examples? JFKs quote assumes that such laws are just and protect civil liberties. It didn’t accidentally include the reference to the Constitution. The “law and order” you have vocalized is oppressive and nationlistic, not just. Yoy can’t expect people not to recognize that when so openly talk about death sentences for petty crimes and deporting those with opposing views. Our country was founded on civil disobedience and rebellion against unjust laws. Its in the DNA of our Constitution and explicitly stated in our Declaration of Independence. Challenging unjust laws has always been were we have expanded freedom instead of being oppressed by the mechanisms of law. And that doesn’t mean I support the wanton breaking of law. It just means we have rights and duties to resist those laws which undermine our very freedom. So when we see the unjust and inhumane treatment of asylum seekers we don’t just accept it as the law; we call it for it’s infringement of the very principles of our constitution. Its why we protect athletes who kneel, citizens who non-violently protest, etc. Stop disingenuously acting like JFK and defenders of freedom actually support your extreme views. We know better. Way to twist Kennedy’s words completely out of context and attempt to use it to your advantage. Pathetic. My bad, I thought redbud wrote that. The context of that quote deals with desegregation, ironically. It deals with a court ordering states to stop enforcing unconstitutional laws. Thank you for proving my point for me. The context of the quote deals with the rule of law. You are wrong again. No, John. The context of the quote is EXACTLY as bikeandfish says. It is YOU who is wrong. Stop blatantly lying to everyone and trying to pass it off as truth. Not one of us believes you. Stop the charade You can be refuted with facts over and over again. You’re not even fighting a losing battle. You’re like the black knight in Monty Python’s Holy Grail who keeps screaming, “Come back and get what’s coming to ya! I’ll bite your legs off!” when he has no arms or legs left to fight with. Do understand context versus content? Content is quote dealing with law. Context is the ruling on Meredith v Fair which required MS to integrate the University of Mississippi under federal enforcement. Mississippi had defied a SCOTUS ruling against the state and so JFK federalized the national guard after help from other federal courts. The quote is from a radio talk to the nation on this subject from Sept 1962. Ignoring that context is ahistorical and fundamentally dishonest. JFK referenced the Constitution and courts because the “rule of law” he was referencing was specifically the process of justice that comes from challenging unjust laws. JFK was a moderate who ultimately disliked civil disobedience (see MLKs’s Letter from Birmingham Jail) but he also understood unjust state/federal laws exist and our robust national history of challenging them. He said as much to Congress on a follow up to his radio speech. Then he said “the practices of the country do not always conform to the principles of the Constitution”. Cherry-picking a quote out of context is lazy and intellectually dishonest. JFK was by no means a revolutionary who supported radical civil disobedience but neither does he history support a simplistic reading of the quote you misapplied. But you don’t obey laws you don’t like, remember? John-lite…no one said that in any fashion. Ugh, Happycommenter, nowhere in the quote you provided do I say I don’t obey laws I don’t like. You are an outright liar. I don’t suffer liars like you kindly. Luckily the truth was out in the open on this very page to expose your fraudulent claims.